Rupa Kalita at the hospital. 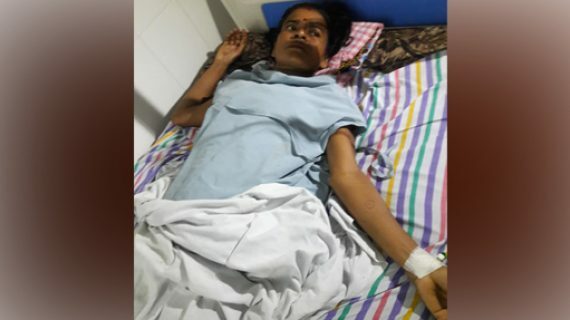 In a shocking incident in Jorhat, a woman from Mudoi Beel area of Majuli district wason Thursdaynight left on the operating table at the KG Nursing Home, with her stomach cut open and then stitched up but without the tumour being removed. Jorhat Deputy Commissioner (DC) Narayan Konwar said that no inquiry had been ordered as it is a criminal matter and an FIR has been lodged and police investigation was underway. A source said that the doctor concerned Siddhartha Burahgohain had told the patient Rupa Kalita that she would have to be operated on as there was a tumour in her stomach. The source alleged that proper tests like ultrasound was not conducted but the operation took place. After the stomach was cut, the doctor had said that this operation was beyond his capabilities and he stitched up the stomach without removing the tumour. He left the private nursing home after saying that he needed to go out for a moment and went straight to his chamber located near Baruah Chariali. Relatives of the woman on coming to know of this created a ruckus and informed the police and deputy commissioner. The police picked him up from his chamber and he was let go after he gave a written undertaking that he would bear all expenses of Rupa’s treatment. The source said that the poor woman who belongs to family which eyes out a living from working for daily wages. The source further said that KG Nursing Home had provided her an ambulance to take her to Guwahati and that she is likely be admitted to Guwahati Medical College & Hospital (GMCH). Sources said Burhagohain has been transferred to Silchar Medical College & Hospital following the incident.